Medicine in China is about as different as it could be from that in the UK and still apply to the same animal. I have some experience of physiotherapists and I would characterise one feature as being that the physio does not puncture the skin. 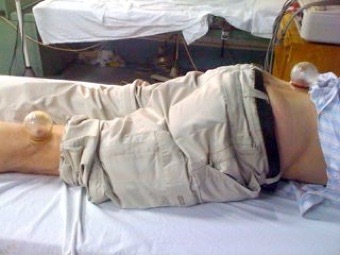 Not so here - and any misgivings I might have expressed about the use of needles in China were completely ignored. It is an entirely different culture. Again, as ever. To the story. I went with my (business) partner to visit the hospital (no such thing as a GP here). The general strategy in the PRC is that some sort of triage occurs on arrival and a bill for treatment is presented for payment. Once this is settled, the treatment occurs - effectively you have a pass to treatment as deemed appropriate, but not necessarily as deemed by the first inspection. Since very few Chinese have the foggiest idea about Biology, there is little or no obfuscation at the initial stage; there are many communication problems without adding all the extra layers that occur when dealing with foreign devils. We know scans are wanted, if only because that's a guaranteed earner; total cost ¥800, a mere £80, paid to the hospital and not the department or individual. Various telephonic shenanigans reduced the usual queuing and we went to see a doctor or physio (I didn't know which at the time) who listened to the explanation and put a sharp finger on exactly the right place, first time. Ow. Where a physio would have massaged and perhaps gone to ultrasound and where an ortho-something specialist would have gripped and wrenched (been there, done that and I stayed cured for most of a year once I'd recovered from the visit), the first (next) thing this guy did was stick a needle in the back of my knee. Knee? Big surprise, not expecting this and no warning. Observed bed-side manner in the crowded room entirely non-existent, but the general level of education is not much higher than 19th century peasant level in Britain. Then there's a pain in the back and I can feel a needle making a feeling very similar to the dentist's "pain-killer". I don't feel the hot cups, see pic, and I'm left in that state for at least 15 minutes. It feels as though something is moving, and the 'explanation' is that this removes something. I'm thinking bad humours, perhaps. You may choose to read that as Victorian humours or a lack of laughing. 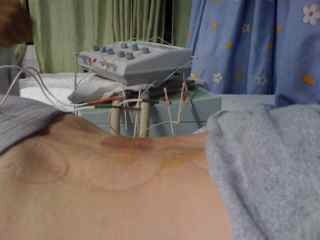 Then we have what I'm going to call electro-muscular stimulation (I took several attempts at typing that, which is funny). 20 minutes or more - I read a book on my iPhone, meanwhile. The hospital looked run-down (think Victorian, though it is probably less than twenty years old) and crowded by your standards. Also not especially clean, but then the heat and humidity don't help one whit. A ‘cold’ day is 26º and ‘dry’ is 35% humidity - which you achieve indoors with the a/c running all day. A ‘warm’ day is 10º and 50% up on that. Apparently I have an appointment for scans that afternoon and I am transported by the company magic carpet back to my apartment. Later I am whisked back (ha !) to have an MRI scan (for ¥600 not £600) and an X-ray. The driver and I have a wait of a mere 15 mins in the queue, utter hilarity in (non-)communication, complete competence in operation and a seamless join between the two scans. The technique in queueing is that you 'join' the queue and you get a phone call that your nominal position means you will soon be at the head. You arrive and so it goes; this looked to be common, but you have to bear in mind that every Chinese spends a lot of effort trying to jump queues—this runs throughout the society. Come back in an hour for the results, I'm told—which same the driver does, having returned me on the magic carpet service. The following evening is Saturday night and I get a call to attend the same doc in the same place that I now see is labelled Sports Therapy and Physiotherapy (and no spelling errors). The doc appears and unlocks the ward (six beds, chinese style spacing, so if you think of using 120% of any space you think of as pushing the limits, you will be close). The scan has been reduced to a single transparency a little smaller than A3 with several pics on it and the X-ray is on paper (!!). Discussion takes place (the room is empty of other patients and stays so) and clearly the doc is enjoying the level of the conversation. There are several moments when he can be seen revising his choice of words and the amount he would discuss, though we are mixing three languages, since the Guangdong locals use Cantonese. Having discussed the problem in some detail - and, I repeat, this was clearly not a usual experience for him—we went on to treatment. So the discussion stopped and I had to persuade and cajole to get any more responses. 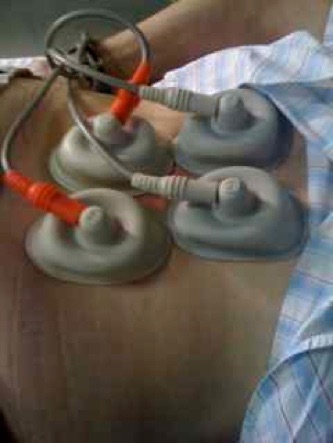 I asked for no more cupping (please), so had a double session of the EMS as the last pic above. The pads are held on with suction, as you can tell from lower down, and the rhythm repeats every 5 secs or so. I’m sorry, I didn't catch the settings. I pointed out that a UK physio (and he turns out to be a physio not a doc) would not cross the skin barrier and would use ultra-sound, so he demonstrated that next: two A5-plus size pads placed above and below and left to run for ten minutes with no associated massage. 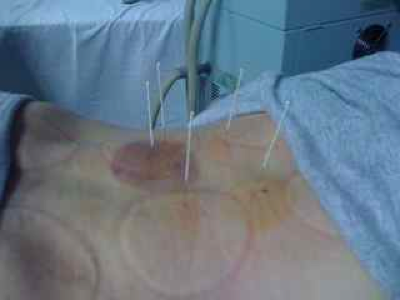 Then he had his revenge and I went back on the front where I couldn't watch and he inserted what we will call acupuncture needles. Round the site and at the pointed location. Five. And then he wired them up, at which point my partner got the giggles, 'cos I was not enjoying this. Keep very still (you big softie) or it hurts a lot in a dentistry sort of way (I gave up on anaesthetics from dentists back in Henley at Trill's suggestion, since I prefer the pain to be immediate and over). Move here and the pain goes all down your leg—very weird and maybe a foretaste of older age that I am not looking forward to. I'm left in this helpless and laughable state for another 20 minutes. Gauges read this time: 3-5 volts on a dial running 0-15, 50-150 ohms observed, so 0.1-0.03. amps. The observed cycle setting was 0.5 Hz, but what I felt was on a two to ten second cycle; a sort of throbbing. I spent the time trying not to move. I've never felt so soft, soggy and wet about applied pain, perhaps because nothing was explained; mind, any anticipation would only be worse. No pregnancy for me, please!! Really weird sensation, quite different from the EMS. So was the feeling of the needles going in, a vigorous flick to puncture the skin and then a remarkable creepy (if quick) search for the 'right' depth with no awareness of the needles when in place. But I walked out of the hospital standing straighter than I have done for two weeks. Today my back is sore in a localised way, but I am genuinely moving more easily. I am hopeful of a run tomorrow (not today, I think, just a long walk). We had a long discussion before I left, forgetting the scan (idiot). I need to look at changing the exercise pattern to help the vertebra stay in its right place, to find ways to sit at desks without aggravating it (harder chair urged here), to ensure the bed is 'hard' (it is by your standards, but not by theirs), to listen to my body (I do), to run circumspectly (is that around the track, then?). But, thankfully no more injunctions to not run, such as I have received in Britain over the last 20 (yes, really 20) years. Here I am among the fastest in the city, maybe the top 0.01% of the population, where in Britain I am securely at the 4% mark of the running population. Yes, I know those descriptions are not equivalent, but it is the best I can do. I have met a few sports students faster than me over 1km, but not over 10km. I have run a race in Xi'an where the only folk in front of me are running in Chinese National colours. Scary, and a the same time a strong incentive to continue for as long as possible. I hope you enjoy this very personal perspective on foreign medicine. Small edits made 201105 and two cities and provinces later. Changing to hard desk chairs has had a good effect. Finding a softer mattress by Chinese standards that is still very hard by British ones would help and avoiding sleeping on ones back when using a hard mattress are all added to the strategies to keep the back in order. Also no more games with the hammock. Reading this once more in 2012 and I have a more coherent explanation from a Doc in Qingdao. Running tends to encourage shortening of the tendons; my running has shortened my hamstrings. The top end of the hamstring is connected., directly or indirectly, to the spine at about waistband level. So ‘more’ running, producing ‘more’ shortening, is pulling at this top connection at the spine, which is why it feels as if a disk has slipped - it is being pulled out of place from below, not misplaced by some other movement more obviously attached to that area. The solution is obvious, then; any amount of stretching to relieve the problem and then more frequent and regular stretching to avoid repetition. Indeed, more flexibility might well improve running performance. Result, two years on from the writing way above, is that there has been one re-occurrence of back pain, now explained and fixed. Also, the flexibility is slightly improved; I have managed to touch the floor occasionally - with straight legs spread as far as I can - this last quarter.